Snoqualmie Falls, in Washington State, attracts over a million visitors each year. The waterfall is 268 feet high (101 feet taller than Niagara Falls) and is one of the state’s premier attractions. It also features a two-acre park, impressive observation deck, gift shop, and lodge. Explore the falls while traveling with Shutter Tours and enjoy the spectacle from the free viewing area, which is accessible to all. Bring family, friends or a loved one and enjoy the scenery together. Picnic around the park, out in the open or beneath trellises, as you savor the breathtaking natural surroundings of the Cascade Foothills. The park is vibrant with color in the spring and summer and is landscaped with native shrubs and trees. Follow the many paths through the park and take a break at a secluded table. Whether you are visiting as a couple or as a larger group, Snoqualmie park and falls will enchant you. There are ample drinking fountains to nourish you and restrooms along the way. Perched 300 feet over the river, Snoqualmie’s observation deck offers beautiful views of the falls and park. If you prefer a closer look, why not hike down the trail to the base of the waterfall? This scenic, historical journey brings you close to a power plant from 1910. Feel the sense of history as you hike; the region was sacred to the native people of the valley for generations. The walk down is steep, but the view of the falls is an even more impressive close-up. The trail is currently closed until fall of 2013 as improvements are made. For those of you who are not on our tour, once you have taken in the stunning views of the falls, why not tuck into a mouthwatering breakfast of pancakes or waffles. The Snoqualmie Store supplies variety and gift packs as well as combination selections of food for your trip. At the Snoqualmie Falls Candy Factory and Café located in the town of Snoqualmie, you can sit down for an old-fashioned milkshake and burger in the 1950s themed diner before enjoying a sweet treat from the selection of candies available. The Snoqualmie native Indian tribe built a camp under Mount Si, and the falls became a meeting point for trading goods. Snoqualmie originates from a Salish word, meaning ‘moon’ and there were many legends based on the area. The Native Americans were called the people of the moon. In the 1850s white settlers arrived in the valley and by 1877 logging had become a major operation in the area, and this exists to this day, bringing timber resources to the global market. A civil engineer, Charles Baker, founded the town of Snoqualmie. He also created a power plant underground, bringing jobs to the locals and generating electricity for the town. The falls themselves have always attracted adventurers. When the first passenger train pulled in to the station in 1889, over 1000 people attended with food and entertainment, including a tightrope walk over the falls. 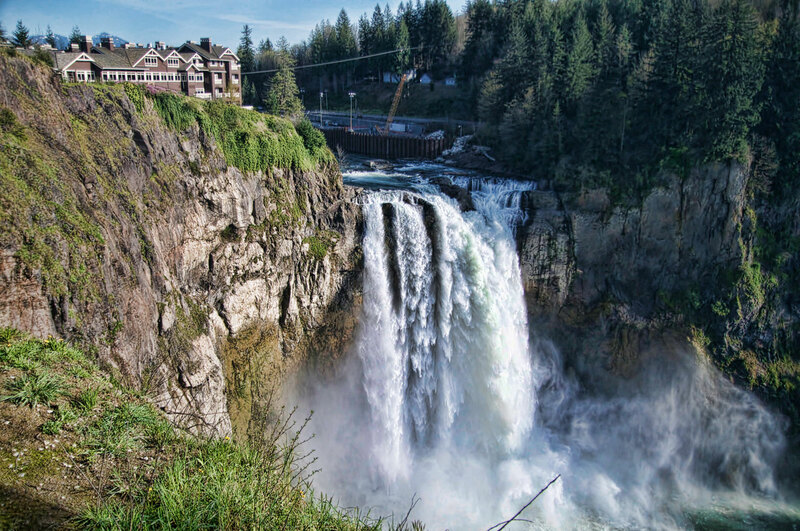 Snoqualmie Falls was used as the external location for the opening Twin Peaks credits during the 1990s. Salish Lodge at the top of the falls became the Great Northern Hotel on screen. The Colonial Inn became the Roadhouse in the show, and the trestle bridge close to Snoqualmie was also used during filming. This venue brings you quality musical theater and is in its 46th season. With stadium seats for around 275 people, it is the perfect location for a bit of forest entertainment. Pick up your tickets and wander along the woodland trail from the falls to the theater, which is lit up in the evening. The theater nestles in 95 acres of land, much of it dedicated to cultural land for the performing arts. At the edge of the property, you can enjoy views of the falls. Shutter Tours offer excursions to the Snoqualmie Falls from Seattle. The journey takes you through the Cascade foothills through the town of Snoqualmie and then to the falls, for many photo opportunities. The Fremont Troll is also included on tour, as is Hiram Chittenden Locks and the breathtaking view at Kerry Park. Washington State is a popular tourist destination and is famed for its stunning outdoor scenery and range of activities available. Shuttle Tours deliver customized and private services and are a highly rated tour operator. Let Shutter Tours take you on a breathtaking adventure that you will not forget. This entry was posted in Seattle Info, Tours, Travel. Bookmark the permalink.